Wow, what a weekend! 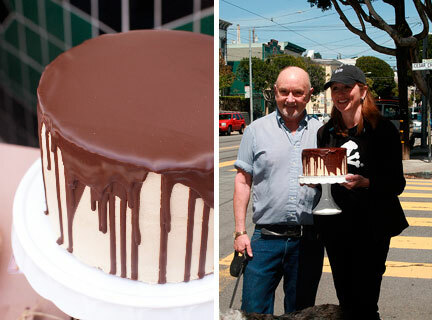 The San Francisco Bloggers’ Bake Sale in support of Share Our Strength raised $1650! Gaby, the national organizer, has reported that the grand total raised by 23 food blogger bake sales around the country was $16,500 – meaning SF raised 10% of the total!! I am so proud of my team and their efforts – not only was it a lot of fun, but it was wildly successful! 1. Find a great location. Somewhere highly visible, with lots of foot traffic, where people who appreciate good food might frequent. Sounds like…Omnivore Books! 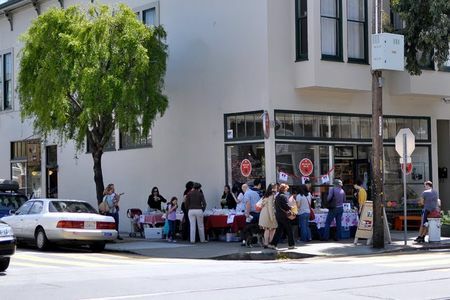 The primo place for lovers of food literature also made the ideal location for the San Francisco Food Bloggers’ Bake Sale. 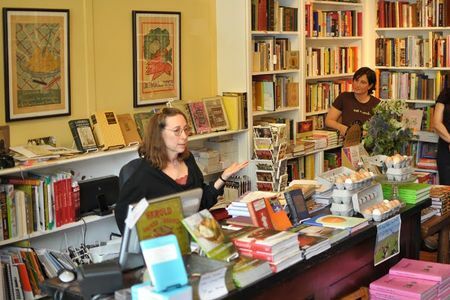 We placed ourselves next to Omnivore Books, on the corner where we could be easily seen from all directions, right in the path of all the neighborhood residents out for a Saturday stroll. Here’s our bake sale – already bustling at 11:30, a full half hour before scheduled start! Omnivore Books is to the left; the pet store we are in front of is also owned by Celia, and she graciously let us set up in front of it. Customers kept asking us if we were selling pet treats! Lesson learned: next time, make homemade doggie treats – given the number of people walking by with their dogs, we could have made twice as much! Photo courtesy of lisa is bossy. I have spoken at Omnivore Books before when promoting my own cookbooks, and knew the store was a perfect fit for the bake sale. 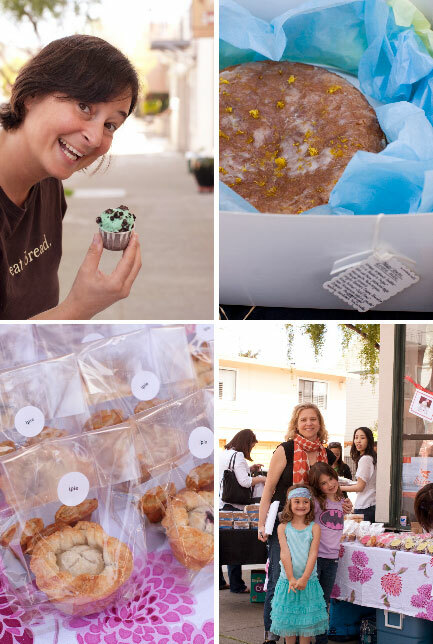 Celia, the owner of Omnivore, was wonderfully enthusiastic and supportive about letting us set up outside – plus she promoted the bake sale on the store website and Twitter feed! I love the San Francisco food community so much! Clockwise from top left: Celia, the super-fun owner of Omnivore Books; beautiful spring-like lemon drizzle cake; happy bake sale visitors (the lady in the orange scarf is Daphne, one of the bake sale volunteers, and in the back right you can see me – a rare moment when I’m not running around like a maniac); adorable miniature blueberry tarts. Photos courtesy of cookingsf. And, in a stroke of sweet serendipity, when I spoke to Celia, I found out that Rose Levy Barenbaum was speaking the same day at Omnivore! 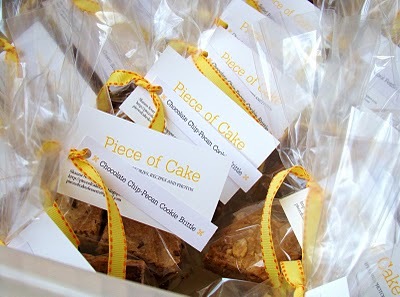 Piggybacking on top of another event – another surefire way to increase visitors to your bake sale! I’d have to say the pastry gods were certainly smiling on our event! The lady of the hour at Omnivore Books, speaking to a very packed house. She was extraordinarily generous with her knowledge – quite an inspiration! Photo courtesy of lisa is bossy. The sooner you advertise for help, the sooner you’ll be able to delegate! Wait, that sounds awful, but really, food bloggers are some of the most generous and giving people I know. Planning with others is much more fun and less stressful than taking the whole burden on yourself, and people will come up with ideas you wouldn’t have thought of on your own. Come up with a list of tasks and create a sign up sheet – I found Google spreadsheets worked really well for real-time planning and sharing. I had people volunteer to bring needed items like tables, napkins, and coolers, to make flyers and signage, to advertise the bake sale through their own social circles.Combining and pooling resources is what bake sales are all about. One of the happiest things I took away from this bake sale was all the new friendships I made – fellow baking enthusiasts, all eager to talk pastry and make sweet treats. Having the bake sale gave us the opportunity to all connect while doing something good for the community at the same time. Truly, when you help others you really end up helping yourself. I was overwhelmed by the positivity and happiness that practically radiated from our bake sale tables! A list of all the participants is at the end of this post – without them, this bake sale would not have been the wonderful success it was! 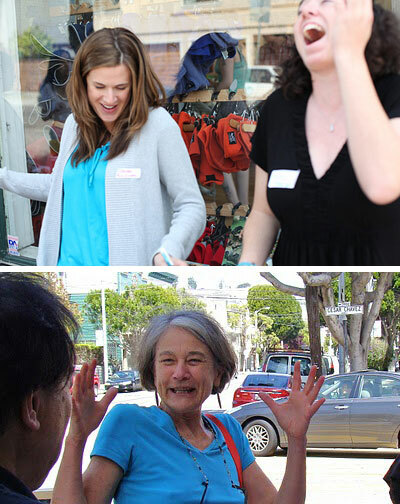 Top: Shauna and Katie, having a great time and charming the customers. Photo courtesy of eatthelove. Bottom: Penni, bread maker extraordinaire, also charming the customers. Notice how happy all the volunteers are? We had a fabulous group of bakers – a huge thank you to all of them! Photo courtesy ofPiece of Cake. I dithered about making bakers go to the extra expense of packaging their products, but on the day of the bake sale I am SO GLAD I asked everyone to come with their items packaged to sell. First of all, it cuts an enormous amount of effort out of the setup – everything comes ready to place on the table. Second, it eliminates any sanitation issues with food sitting out in the open being handled by dozens of people. Third, and most importantly, it gives you a chance to present your food in a professional and enticing way. The photos speak for themselves – how gorgeous and appealing does everything look? It’s prettier than some retail bakeries! 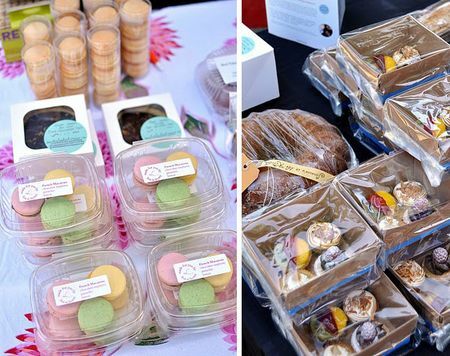 Left: Did you think a bake sale in SF wouldn’t have macarons? Why bother with a trip to Paris when you can get some here? Sandwiched between the macarons are some swoonworthy Meyer Lemon and sea salt chocolate tarts. Seriously, what Paris? Right: And again, no need for a transatlantic plane flight to pick up some truly beautiful fruit tartlets. I almost teared up when Ray brought these tartlets – how amazing is the food blogger talent? Photos courtesy of lisa is bossy. Also, I should have realized that food bloggers would be all about presentation and would jump on the chance to show off their products in the best possible light. Look at the detail and care on the packaging! San Francisco food bloggers are serious when it comes to presentation! Another lesson learned: bloggers, put your blog info on the packaging! Many customers wanted to know the participating blogs and unfortunately we didn’t have a printed list! The bake sale is your chance to publicize your blog and show off your talents! Photo courtesy of Piece of Cake. 4. Establish pricing and payment system beforehand. Another issue I mulled over until fellow baker Robyn said, “You need to make things as easy as possible for you and the customers.” Exactly! K.I.S.S. principle. The solution that worked for me was to come up with three to four price points ($1, $3, $6, $12), and ask bakers to bake and package their items based on these categories (e.g. one big individual cookie for $3, a small fruit pie for $6.). The morning of the bake sale, we set up tables and designated each one with a price, and all items with that price went on the table. It made for fast set up – no need to stick a price tag on each item, AND it made it easy to sell to customers (“Everything on this table is $6”), AND easy to sum up purchase totals. The $6 table. *sigh*, still swooning over the packaging. Photo courtesy of lisa is bossy. Also, I preferred to have all money transactions in one corner, to make it easier to keep track of the money. I gave the staff restaurant-style check books and had them write down what the customers wanted. Then the customers took the receipt, went to the cashier’s table to pay, and then could go back and pick up their items. I liked this system because it prevented having ten people descending on the cash box at once to make change, and the receipts provided a way to verify what was sold (if you’re really nerdy like me, you can use the receipts to determine which items were most popular – valuable data for the next bake sale!) Of course there are many different ways to run your event, but the point is to come up with a method beforehand – one that will be easy for you and everyone else to understand and follow. Left: Gluten-free mint chocolate brownies! Right: “Uh, what do we have that’s vegan?” I swear I didn’t have that clueless look on my face all day. If you can, including gluten-free, nut-free, and/or vegan options will make the special-diet customers happy – and be prepared to know where they are, unlike me! By the way, we did have vegan cookies! Photos courtesy of eatthelove. Of course you want the classics at your bake sale – cookies, brownies, cupcakes. But think about bigger-ticket items: after all, the higher you can price your items, the more you’ll make! And they make stunning centerpieces for the table that will catch the eyes of passerby. We had about four big cakes brought in; each time one arrived, we put at the corner table as the centerpiece. Each time, the cake sold in minutes. Literally! Left: A stunning chocolate and coffee buttercream cake. Photos courtesy of cookingsf. Right: We had the cake out for about ten minutes when this gentleman snapped it up. As we didn’t have a cake box, Pat generously walked it back to his place a few blocks away! Talk about service! Photo courtesy of One Domestic Diva. You know why grocery stores put the candy bars and mints right next to the checkout stand, right? Same principle works here! Have a bunch of small $1 items, like individually wrapped cookies or brownies, or mini cupcakes, next to the cashier. You’ll be surprised how often people will “add on” while they’re paying for their original purchases! 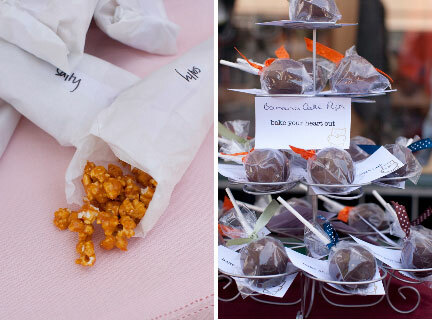 Robyn made caramel corn and packed them in adorable little paper cones, and we put them at the cashier’s table – they vanished within the first hour! Not only does everyone love caramel corn, but at $1, who could resist? Left: Caramel corn, in salty (regular) and spicy varieties. Right: The most precious display of chocolate-dipped banana cake pops. Photos courtesy of cookingsf. 7. Have a donations jar at the register. People want to help out – give them every opportunity to do so. It’s surprising – and gratifying – after you explain your cause to customers, how many of them put their extra bills into the donations jar. I’ll also let you in on a little secret: Notice how we priced the items at $3, $6, and $12 – all prices that are likely to require making change? :) I know, it’s sneaky, but see how there are all these chances to create openings for people to further cont ribute to your cause? All these little things add up! Left: Note pink donation can in the corner, and money headed towards it! Bonus tip: Having a reliable, hardworking, cheerful person – like, say a significant other – working the cash table is a great help! Photo courtesy of lisa is bossy. 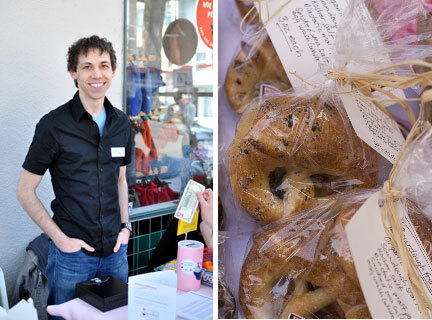 Right: Breads are an impressive addition to the bake sale table – look at these fabulous pretzels! Photo courtesy of cookingsf. 8. Find a place to donate the leftovers after the bake sale. Of course, in a perfect bake sale world, all your beautiful goodies would be gone in a twinkling! Well, just in case there’s some items left at the end of the day, be sure to research beforehand and find local donation centers to drop off leftovers. Keep the good karma going and make sure every cookie and cupcake finds a happy hungry stomach to fill. More beauty shots – hard to believe anything was left, huh? That little sweetie in the bottom right corner belongs to Robyn, one of the bakers! Photos courtesy of Bake Your Heart Out. Again, a huge thank you to Omnivore Books for hosting our bake sale, to everyone who came and supported us, and of course to all the fabulous baking bloggers who lent their spatulas to the cause! And a big thank you to Ariel, Catrina, Carlo, Diana, Kelly, Lili, Ray, Robyn, and Shila, who also contributed their goodies to the sale. 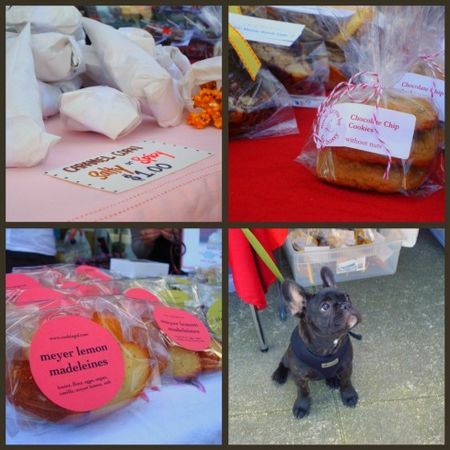 « San Francisco Food Bloggers' Bake Sale – This Saturday! Fabulous job Anita – thank you so much! You rock! YAY! Anita you did a FANTASTIC job! It’s was such great fun to meet everyone there! And the food was swoon worthy! I look forward to the next one!!! You did an amazing job Anita! It was a pleasure meeting you and the rest of the food bloggers (and non bloggers) there! And, of course, the food was totally swoon worthy! Congrats on the awesomeness of it all! $1650!!! Whoo hoo! I look forward to the next one! Anita it was so great to finally meet you on Saturday! Thanks again for planning such a spectacular event. What a great event! I love the packaging! Great work, what a fabulous event. Congratulations! and wonderful bakers! Came from Mendocino County for the event and was not disappointed. Had an event later that day and my contribution was -guess what. I kept tags to thank individuals, but one cake, a round almond affair was ripped out of my hands and devoured. Can the baker please stand up and be recognized and hopefully share the recipe. Would like to help next year.Fab event-great cause-good energy-we need more of this. Great post Anita and thanks again for all of your hard work! We are very excited about the $1600 going to a great cause. Wow everything looks great! I wish I was there! Great job Anita–the bake sale and the blog posting! How useful to teach everyone the tips and tricks you picked up. AND, best of all, Maia is famous!! It’s her first appearance on the internet. : ) So generous of you to recognize all of the contributors, but you really deserve most of the credit! I love the packaging. I kept tags to thank individuals, but one cake, a round almond affair was ripped out of my hands and devoured. wow! everything looks amazing! I wish I could have been there to grab some of those tasty looking macaroons! Thank you so much for all your great ideas. There is so much to think about when setting up these things. having everything in order like this make such a diffrence. the packaging on the cakes looks fantastic. Really colourful and simple, but very effective – Well done. Looks like you had a super successful day!! Great job! that’s interesting about the big cakes selling so fast. i would have thought they’d just sit while people bought up the cheaper stuff. sounds like a great event. 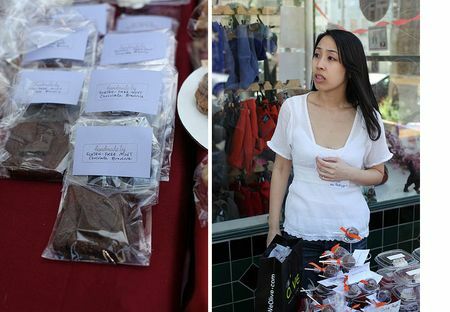 So funny, I was just googling fellow dessert blogs when I was scrolling down yours and saw a photo of my neices at the bake-sale! Ah ha! My sister in law is from CookingSf, so Hello! Hi Anita! I myself am trying to set up a charity bake sale in San Francisco as well, and came across your post when looking for tips! So much good advice!!! Thank you! 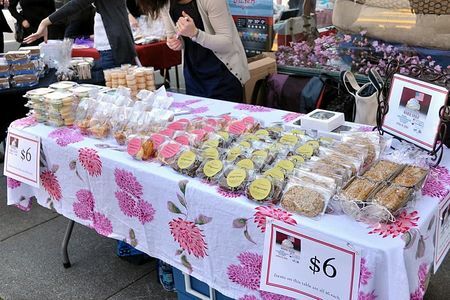 I was wondering if there were any other locations you would suggest in the city that would be good for a small bake sale? Wonderful, Hailee! You can also go to the my official team bake sale site at http://www.bakesalesf.wordpress.com for more information and tips! Good luck and happy baking! Wow. Seriously impressive. I’ve been entertaining the idea of a mini bake sale to raise funds for my neighbor and I (respective charity runs) but it seems very daunting. Do you have suggestions for where to buy packaging? Sur la Table and Michael’s (craft store) sell lots of cute packaging supplies now. If you’re baking a lot, finding a professional cake supply store or buying online may be cheaper. Good luck! That sounds like something I would love to get in on! Too bad I am a few states away!! Your photos are wonderful! Eye appeal is first and foremost! My church is having a bake sale this weekend for the youth and I really liked one of the packaging. What is the tall clear cylinder with a lid called and where could they be purchased. I believe that it had cookies in them. Always looking for something different. You did a wonderful job, thanks! Thank you so much for the kind comment! I’m not sure of the exact name, I think they’re just clear plastic cylinders with lids. As for where you can get them, maybe a local craft store like Michael’s or the Container Store? I didn’t use them so I’m afraid I’m not sure. But I think I may have seen something like them at the Container Store. Good luck with your bake sale! Where did you find all of your bloggers? I would love to do a bake sale like yours to support our church. I was lucky that there is a large network of food bloggers in the bay area, so I was able to contact them and find volunteers. Also we had national organizers who directed potential participants to the local organizers (like me). Perhaps you could also ask your church members or parents from your local schools or clubs to help out? good luck! So glad that you found this useful! Hope your bake sale went well! Awesome tips and tricks and pictures!! Thank you! !